Building work on Fera Science Limited’s new mesocosm testing facility is nearing completion in Sand Hutton, near York, UK. 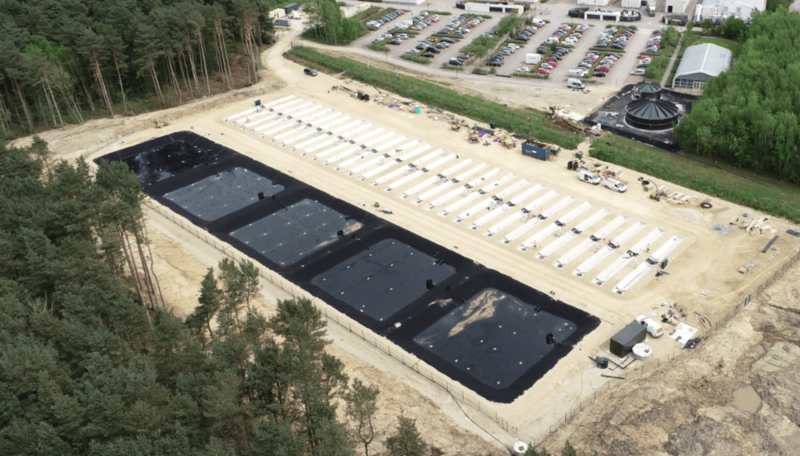 The E-Flows mesocosm is a groundbreaking project developed in partnership by Fera (formerly the Food and Environment Research Agency), the Centre for Crop Health and Protection (CHAP) and supported by Innovative UK. It has been designed, developed and will be managed and operated by Fera for use by the agri-tech industry and researchers. Launching in summer 2018, the outdoor experimental system will perform simulations of natural aquatic environments under controlled conditions. As plant protection products such as pesticides are developed, manufacturers will use the mesocosm to demonstrate that their products are safe for aquatic environments as part of higher tier testing. In October 2017, work commenced on a 40m-deep borehole which, when operational, will feed clean water into five one-metre deep lagoons. Filled with invertebrate life and plants, the lagoons naturalise the water, before distributing it across a series of 30 rushes, simulating the drainage on farmland. Each of the rushes comprises two 10m lengths, through which naturalised water will flow. During testing, they will feature the relevant protection products. The majority of existing mesocosm facilities are static or simply recirculate water, Fera says. However, this is not representative of what actually happens in a natural environment, where fresh water is constantly flowing in streams and ditches. To overcome this, the mesocosm is supplied with a continuous flow-through of aged, fresh water. Once the water has been tested and it has passed through the rushes, it must then be purified before it can be re-introduced into the surrounding environment. A three-pump recycling system has been installed onsite at the Yorkshire facility to undertake this activity. Storage tanks in the recycling system collect water before it is passed through granulate activated carbon filters. Any chemicals in the water will be filtered out and collected by the carbon, before being re-introduced into the local environment.